• Strong and reliable motor. Nuova Rade is a leading company in design, production and sale of plastic accessories for boating trade. Its leadership is the result of more than 52 years of industrial experience in this field, placed at disposal of yachtsmen and boating professionals all over the world. The company may rely on the production of more than 850 items, among which: buoys, lifebuoys, hatches, boat hooks and fuel tanks. Its wide range of products, together with the quality of its production, may completely meet the expectations of the most exigent customers. 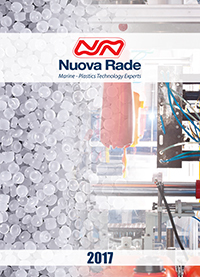 During the years, Nuova Rade developed an extraordinary expertise in plastic raw materials know-how by using different technologies, such as injection, rotational and blow moulding.